A Mothers Ramblings: What is General Conference? Right, we, as a Church, believe that we have a living Prophet on the Earth today. This Prophet is also the President of the Church, his name is President Thomas S. Monson and of course being a prophet we believe that he has revelation for us in the latter days. Now, here comes the bit about General Conference. Okay, so if we believe that there is a Prophet on the earth today, it makes sense that we would want to listen to his counsel right? Well, here's the thing. We do! Twice a year in April and October, the whole Church gathers together to hear what the Prophet and other leaders in the Church have to say. We call this General Conference. It takes place over two days, and here in the UK we can do one of two things to watch it. We can travel to our local Stake Centre (it's like the dioceses, you know a district thing) and watch it together as a congregation (it's great fun doing it like this) or we can, by the magic of the internet, watch it via the website LDS.org. I have watched a few different conferences at Stake Centres, and it's great fun. It's really lovely to be able to watch with friends and family and take notes together. However, my favourite is actually staying at home and watching it with all my family because I end up sitting on my bed, with Top Ender and we watch it on a big Screen, making notes together and tweeting quotes that we like. Plus I'm pretty sure my husband likes it because during breaks I do big sort outs of all the my junk in our bedroom! 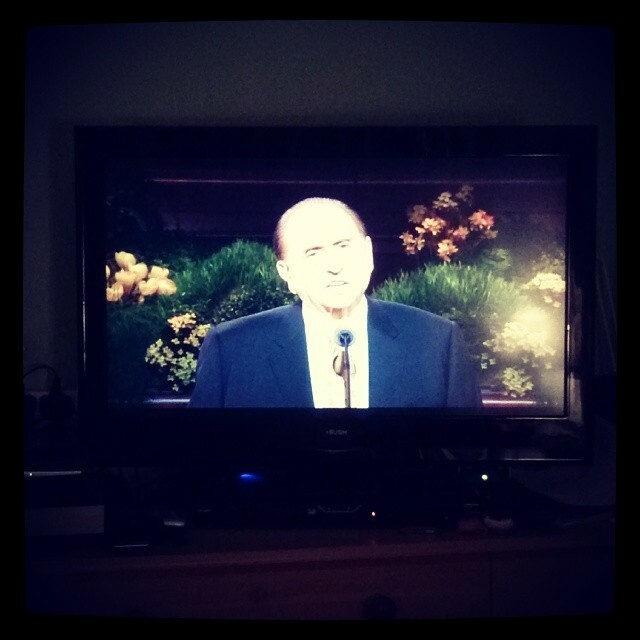 General Conference is a chance for us to listen to the leaders of our Church to talk to us about basic gospel principles or to talk about significant issues which we might be facing and generally encouraging members (and non members who want to tune in too) in their efforts to follow Jesus Christ. So that's what I'll be doing next weekend. How about you?